Madam Hillary let the cat out of the bag on Extraterrestrial Contact. You never see Madam Hillary and Mazlan Othman at the same time, do you? They may be the same shape-shifting alien being. We all know they're out there. It's a certainty. Everyone who watches NOVA knows it. It's Scientistic. There have been too many sightings, to many close encounters and too many crop circles and other alien art work for anyone to believe otherwise. 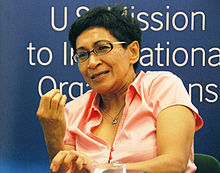 Thank the Force for Mazlan Othman, the Astrophysicist who has been assigned by the UN to be the official Ambassador for Extraterrestrial Contact Affairs, and head of the UN Office for Outer Space Affairs (UNOOSA) located in Vienna. She was appointed to this vitally important post in in September 2010; the typical salary for a UN Ambassador is $150,000 per year, plus expenses, plus aloofness and insulation from any laws of any nation she might be in at any moment in time. That's important because UN Ambassadors and other UN officials are so smart they can't be bothered with any laws in any mere sovereign nations; they need to be concentrating on important scientistical matters of vital importance to the planet, the galaxy and the whole interstellar system. And we all know about the brain power gathered in the UN. 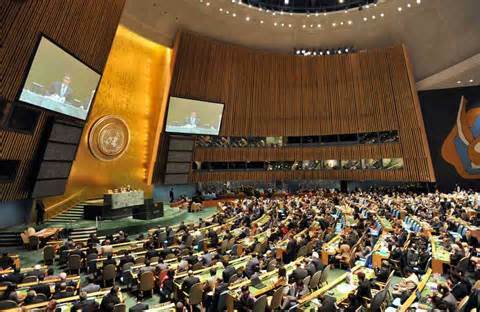 Just look at any image of the UN in session, and you can see smartness on parade. The very room, and all the symbology and imagery proves it. Why, you couldn't even get in the building, let alone the room, without highfalutin degrees and letters after you name out the wazoo. Madam Hillary fits right in with this super elite company. She's been explaining and describing extraterrestrial life since she was a radical teeny-bopper back in the '60s. She knew all about it, way back then. And how, you might wonder. She was, seemingly, way ahead of her time, even ahead of the astrophysicist Mazlan Othman. She seems to have almost supernatural powers enabling her to control large masses of political supporters and voters, all previously written off as the Useful Idiots associated with the lies of Marxism. But maybe, just maybe, there's something else going on here. In the past, she has only explained extraterrestrial life. More recently, she has let it be known that earth has already been visited by them. 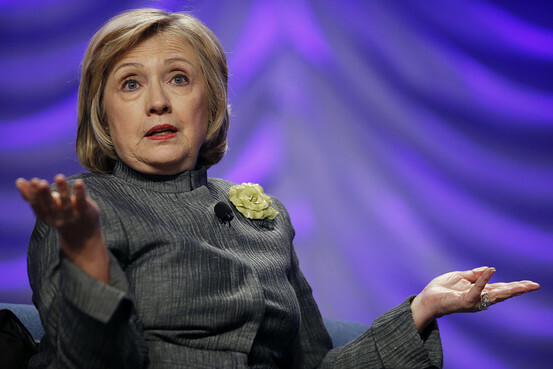 Madam Hillary, in her current form of an exceptionally elderly white woman, is still explaining extraterrestrial life to the rest of us ordinary people who couldn't possibly know any better. But now the explanations contain admissions that They Have Already Been Here, and, Maybe We Should, Like, Investigate Area 51. Asked about why we see no physical evidence of visitors, she adopts the typical Scientistical final response of WDN9 standing in her classically recognized "brilliant person wondering about it" pose. 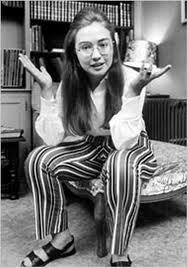 Followed closely by her famous "What difference does it make?" question qua-statement. Now, most people don't know, since we brilliantly changed our name from "Thinking Catholic Strategic Center" to "Catholic American Thinker", that we are actually a major international Think Tank, where we do lots and lots of heavy duty thinking. When we first started out, we were going to build a secret underground bunker to do our thinking in. But I really wanted a window office, and who wants to look out the window at a bunch of dirt? So, we built a secret above ground bunker to think in, where I can look out my window at the back yard. My title, at the Strategic Center, is Supreme Allied Commander. Currently, my wife Marcie, second in command, is the Western Hemisphere Commander In Chief, and my nephew Mark, third in command, is the North American Commander In Chief. But with the new knowledge of all this extraterrestrial activity, and all of this odd, un-sourced and unexplained expertise on it now apparent, we are now looking to expand our scope from mere international to interstellar, and intergalactic, an inter-whateverelseisoutthere, so that, just as soon as one of the little green boogers shows up and says "Take me to your leader" we will contact Mazlan Othman, and/or Madam Hillary, whether separately or together, depending on their shifting status at the moment. It's important to us, as a big time Think Tank, that we follow the lead of the UN in expanding our scope to include the known and unknown universe, or universes, as the case may be. After all, it just dosen't get any smarter than the UN. Right? Back last summer I was leaning toward Cruz. But between his "bypass the voter" strategy and The RINO hackorama that has lined up to support him (Now Jebbie...what does that tell you.) Well it tells me two things. It tells me that it's OK to change my mind, and it tells me to support Trump. Sorry I can't stay with you on this one. That's OK; I'm not a "Never Trumpster". But what do you think about my extraterrestrial communication expertise? I would be willing to do Mazlan Othman's job for half price. God Almighty (your/our boss) certainly could have created other sentient beings... Like angels..and/or Saints. On the other hand, rebellious darkness stood up the army of evil...the principalities and powers of the air, political entities, enemies of God, who only acknowledge their own place of supreme, self-created navel gazing ultimate authority, boiling the proverbial frog... No wonder the illusion of "global warming(alarming)" is manifestation of the demonic hierarchy and gorged upon by the useful human fodder(yet another assault upon God's most precious creation...mankind). We wrestle not against flesh and blood...but evil says, "surely you won't die"...another illusion used to create tension, without MERCY. I can do without the "party" associated and responsible for that and other evil (KKK was/is established by "white" demoncrats). So, yes, reality is, there are extraterrestrial beings here....but their source and deviance is not of God Almighty, but straight outa hell. Come Lord Jesus, the good Shepherd who's voice is approaching! To Jesus Christ be all the Glory!!!! There's other critters out there too; I seen 'em on the Tee-Vee. There's big foots (or feet) and mountain monsters and swamp critters. They couldn't say it on the air if it wasn't true. All my travels back when driving an 18 wheeler OTR, I always kept my eyes pealed for 'em, but I never seen one. But I know they're out there, just the same. 'Thought I saw one once driving through Louisiana, but it turned out to be a big honey-colored black bear mugging someone's garbage can. I'm with you. But the scary thing is, there are so few of us in the one and only civilization-survival lifeboat. When the whole world upside down and going nuts, it gets harder and harder to keep track of your own uprightness and sanity. I will just cling to the Rock of Salvation, and keep rowing, and keep calling, and keep hoping. An Act of Hope keeps despair at bay. We know how it all ends, but ... so many do not. So many are fooled, and they don't even know they are fools.